Strategic Play Group Ltd. - Who are The Global Federation of LSP Master Trainers? Who are The Global Federation of LSP Master Trainers? Why do we need this Global Federation? The Global Federation has been developed to ensure that the training offered by and/or supervised by the Master Trainers continue to meet the highest standard. All members of the Federation train and certify facilitators in LEGO® SERIOUS PLAY® methods globally. The training offered is of the highest quality and continues to innovate under the LEGO® SERIOUS PLAY® Creative Commons license. We develop and offer training in LEGO SERIOUS PLAY methods but have innovated the application using creative problem-solving techniques along with agile methods, art and play therapy applications, all in a neuro-friendly process. The unique training is academically sound as we work in conjunction with an experienced curriculum designer. The Innovative Certification Training offered under the Strategic Play Group Ltd brand has been approved by the Global Federation of LSP Trainers and Practitioners. When you train under one of these trainers you will also be registered as a certified facilitator in LEGO® SERIOUS PLAY® Methods. When you see this logo (below), proudly displayed on email addresses and on websites, you will know that the person has been well trained in how to apply the tools of LEGO SERIOUS PLAY Methods to design quality workshops and events. 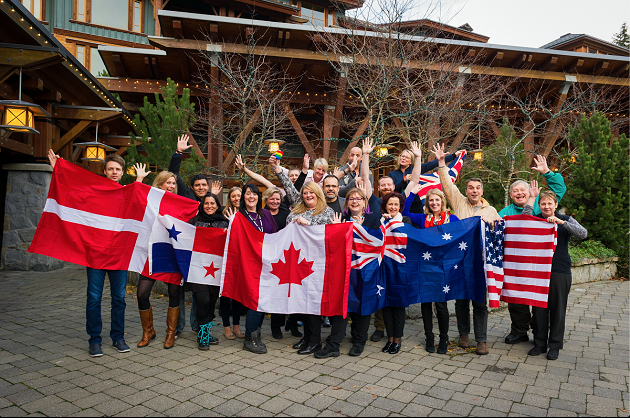 In 2016, at second our annual global un-conference and meeting for certified facilitators in LEGO® SERIOUS PLAY® methodology, a group of 30 facilitators (some in the picture below) met in Whistler, British Columbia, Canada where they deemed it valuable for a formal association to be developed. Dr. Denise Meyerson and Jacqueline Lloyd Smith, both original Master Trainers with the LEGO Systems Group, were asked to establish the Global Federation of LSP Master Trainers. Now you have the back story. Denise and Jacquie were both long-time partners with the LEGO® Systems Group Serious Play® Division. They started training in 2007 and were appointed to the LEGO® Training Board by the LEGO® Play4Business Division 2009. The duo were the first official LEGO Partners, and trainers in Canada and Australia and trained globally for the LEGO® Group as "Master Trainers". Their training experiences extend over 25 years - specifically using LSP since the early 2000's. More high energy, professionals trainers are joining our team each month.